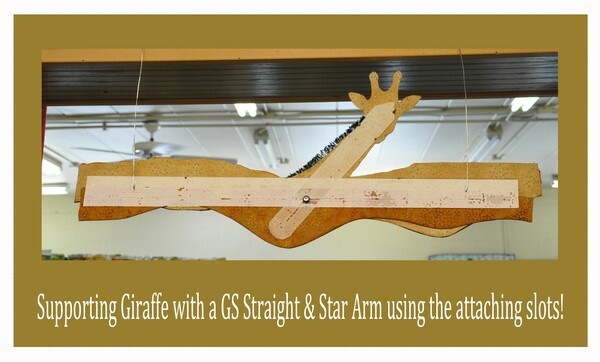 Gone Sleeveless Art Quilt Hanging System - Patent Pending! There is not another system out on the market like it! Gone Sleeveless with its full system supports Squares or Rectangles, Circles, Diagonal or Diamond, Stars, Irregular & Pelts! The basic system uses some key elements and materials, all under patent pending protection.Each piece of the Gone Sleeveless Art Quilt Hanging System can be used individually or concert with any other Gone Sleeveless piece and with custom design available the possibilities are endless! Here are some key elements that make this system unique! You are connecting the quilt support directly; eliminating the middle man...the sleeve!! Yay! You have two attaching options Sewn and Adhesive! 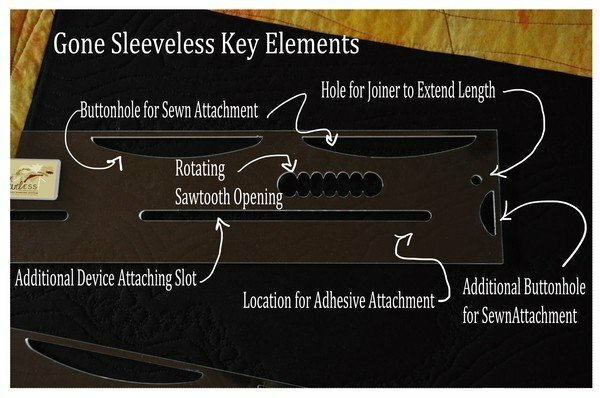 The Buttonhole allows you to whip-stitch our device directly to the quilt totally eliminating the need for a sleeve and a dowel! The Additional Buttonhole gives you the option of additional stabilizing support if you have a heavily embellished quilt! The Rotating Sawtooth Opening gives you the capability of rotating our device or either attaching methods with the needed adjustment the "teeth" give you! Location for Adhesive Attachment, you need a good solid surface to place our adhesive with this additional space it gives you that needed surface. Additional Device Attaching Slot gives you an opening to attach other devices within the system to support out cropping on your quilt!! The picture below shows how the slots are used to attach additional devices to the main supporting device. Final Element is the Hole for the Joiner which gives you the option to extend the length of the Gone Sleeveless Straight devices.